I wanted to do this week’s weights session during my lunch hour, but I found out I had left my training shorts at home. So, instead, I spent an hour on the erg in the evening. So I rowed three intervals and used Quiske in the first and last ones. The virtual coach liked the last interval much more than the first one. What are the differences? Seat speed faster than handle speed in the first part of the drive? That doesn’t look good. Handle speed then takes over seat speed in the first half of the drive. This is my back opening (or my arms bending). That doesn’t look good either. As I get tired (red curve), the hands away is less pronounced. All in all a whole lot of technique things to check on. A brutal weights workout, well at least for my tiny muscles. After months of body weights and cable machine exercises, I am starting to be ready for the “big” weight lifting exercises. I did a 2k warming up on one of the horribly maintained Concept2 ergometers, the one with the working battery. In true gym style I have to set the slider to 10, but that is only to get a reasonable drag factor (120). The sets shown on the left are the “work” sets. For each of the workouts, I did a few “warming up” sets, where I gradually increased the weights. The prescribed “work” was 3 sets at 60% of 1 Repetition Maximum (1RM) and 2 sets at 70%. I had to guess my 1RM maximum, because I have never done the testing. Each set was to be done to exhaustion, but as I had no chaperone, I stopped one or two reps early, just to make sure the weights wouldn’t collapse on me. I found a very cool app to record my workouts. It’s called “Simple Workout Log“. It’s perfect. It doesn’t get in the way. You prepare a routine with all the exercises you want to do, then when you do a set, you quickly enter the weight and number of reps, which is a one thumb operation. Also adding a new set is a one click. Even though the app looks very simple, you can basically operate it with one finger, and it seems to be very well thought out. The next screen I needed was always just one click away. I am not very sympathetic to people playing with their phones in the gym. When you’re working out, you’re working out. OK to use a phone to record your workout, but I see people writing emails, making phone calls, texting, apping, facebooking, and what not, all the while occupying workout stations. 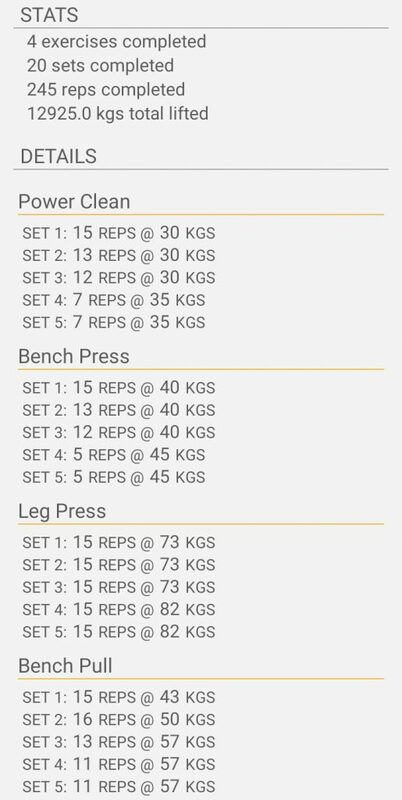 Once you have done a few sets, the app also estimates your 1RM maximum, which is probably slightly underestimated in my case, for the reasons mentioned above, but it is a very cool feature anyway: It gives you a little table of weights for 1 rep, 5 reps, 10 reps, 15 reps etc. It’s also syncing to the cloud so you can use the app on different devices. And finally, it charts your progress. I think I am going to be finding a lot of motivation from this extremely simple app. It shows that providing just a little extra functionality on top of a paper notebook can already be very valuable. So Bench Pull, Leg Press, Bench Press, and Power Clean, in that order. Power Clean is really the exercise that I am the weakest on. For next week, I have hired a weight lifting pro for one hour, to help me with form. I had a late ending work day, so I went out in the morning. I forgot to wear my heart rate band and when I discovered that on the dock, I was too lazy (and time pressed) to go back to my locker. 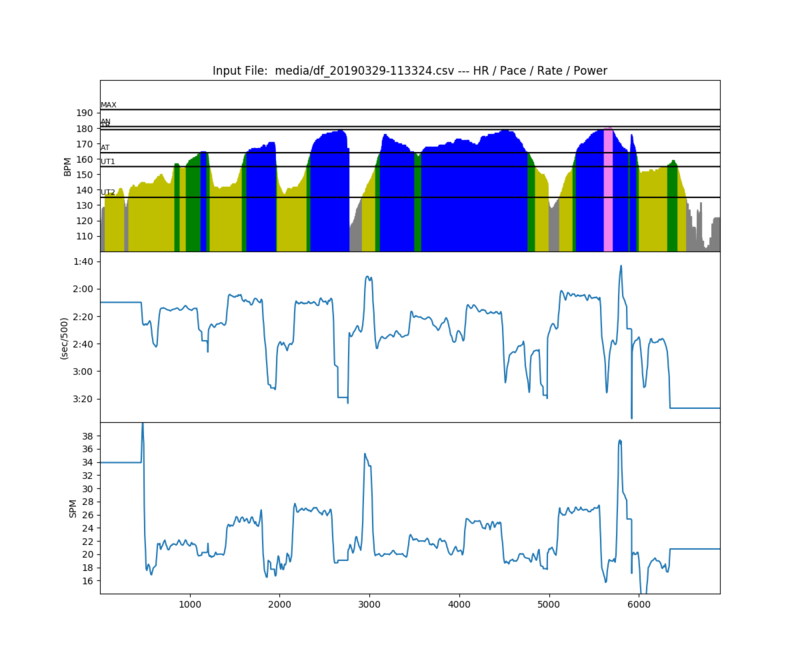 This was supposed to be a steady state row anyway, so I wasn’t expecting any heart rate data of interest, and as I have a power meter, I can use power to measure training load. I actually did a few 2 minute intervals at fixed stroke rates (22, 24, 26), with tailwind, and with headwind. I did this with the plan to run the same test on a boat I was going to test on Friday. I will defer the Quiske analysis to the end of this post. Up early for the drive to the Argonauten rowing club in Vienna. My own sculls on the roof rack. It’s just a 90 minutes drive, so I left 5:15 to be in time for a 7AM training. The single didn’t have a C2 holder, and it had one of those modern reverse wing riggers, so I didn’t have a place to put the NK SpeedCoach. 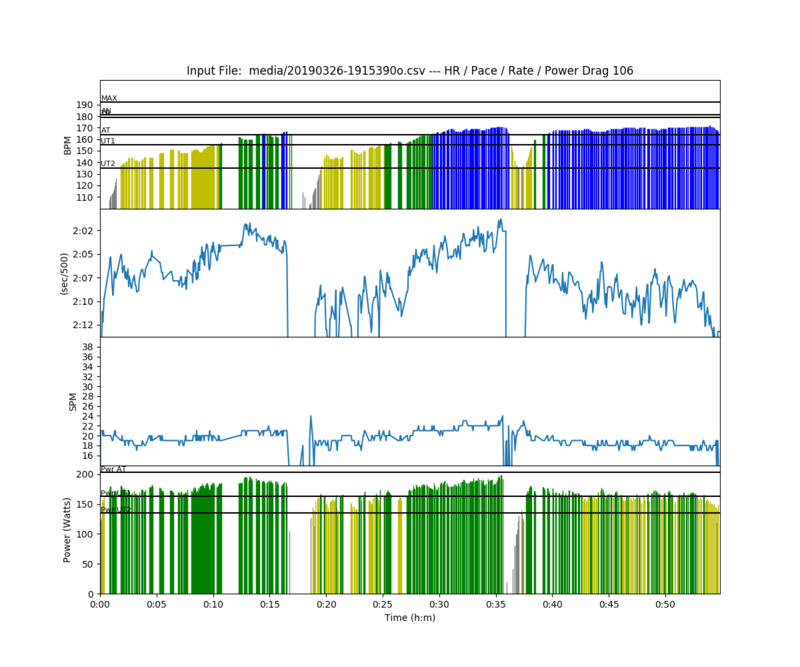 The chart you see is a miracle of data fusion. 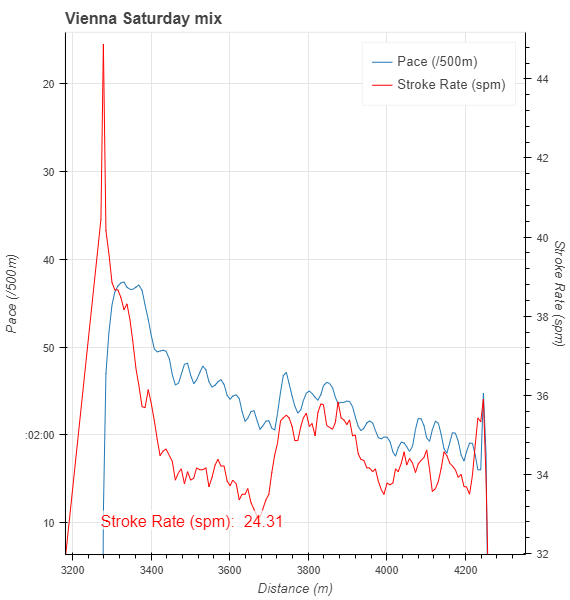 I recorded heart rate on the Polar OH1 arm, position and speed using the Garmin watch, and I got stroke rate and stroke length from the Quiske app (using their CSV export to Rowsandall). So in the chart, each window is from a different device. 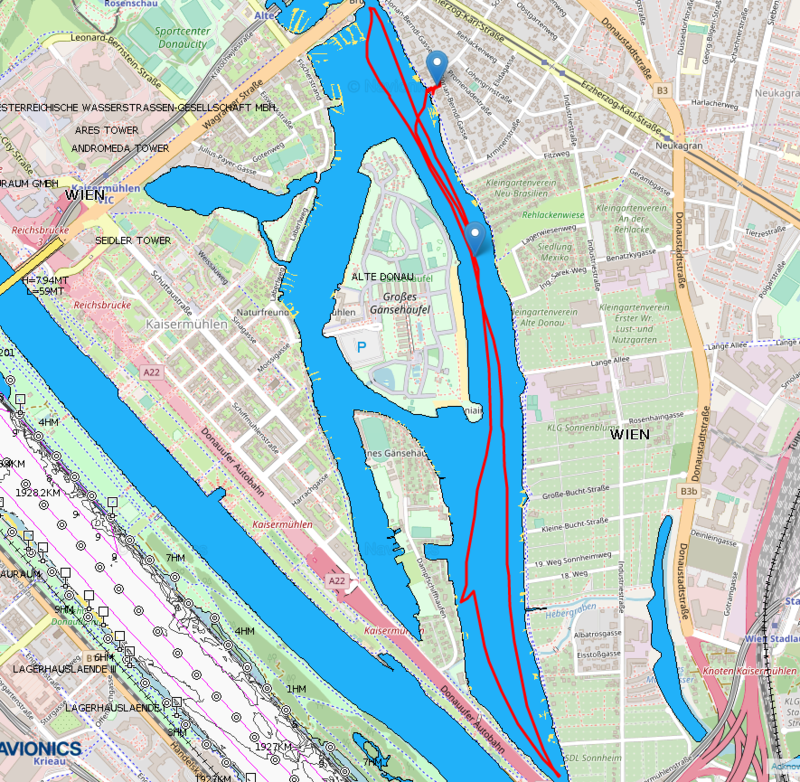 As you can see, I just did a short workout on the Alte Donau. So how did the comparison work out? Bird song in Vienna is the same quality as in Brno. I love morning rows for the bird song. 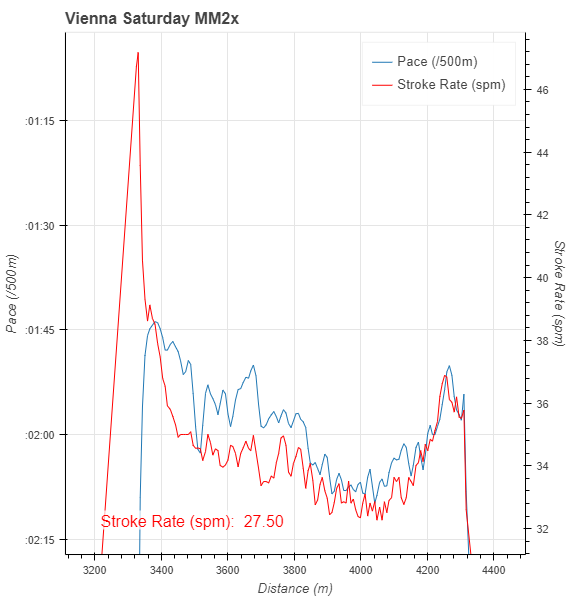 I won’t go into comparing boat speed, because the water temperature in Vienna was much higher (a tropical 8 degrees C) but the Alte Donau is much shallower, so comparing boat speeds is not a good thing. The boat felt very comfortable, familiar, and responsive. Stiffer than my own older single. Very similar to our (same brand) double ORCA. That is me being to cramped at the catch. I need to get rid of that bump. And now that I look in detail again, I notice that I am cleaner on the tap down today than yesterday. Not sure if that is the boat or just me trying to row cleaner because of a coach on the bank. And then there is a final thing. Looks like the last part of the recovery is a little different. Hm, have to think more about this. I had been drafted to fill a seat in two Donaubund boats. Their regular rower had a bicycle accident and was unable to row. Of course I was happy to fill in, knowing that Andreas Kral and Marko Milodanovic are excellent rowers. I was hoping I wouldn’t disappoint them. We met at 8am and rigged the boat, a nice Filippi quad. We were up against two boats, who had both entered as C. However, at the start line we would find out that the crew from Salzburg was actually a E crew. The third crew were my friends from Bohemians Prague. Today, I wouldn’t underestimate them. It was a pretty heavy headwind. Rowing to the start we did a few practice starts and that was the prep. 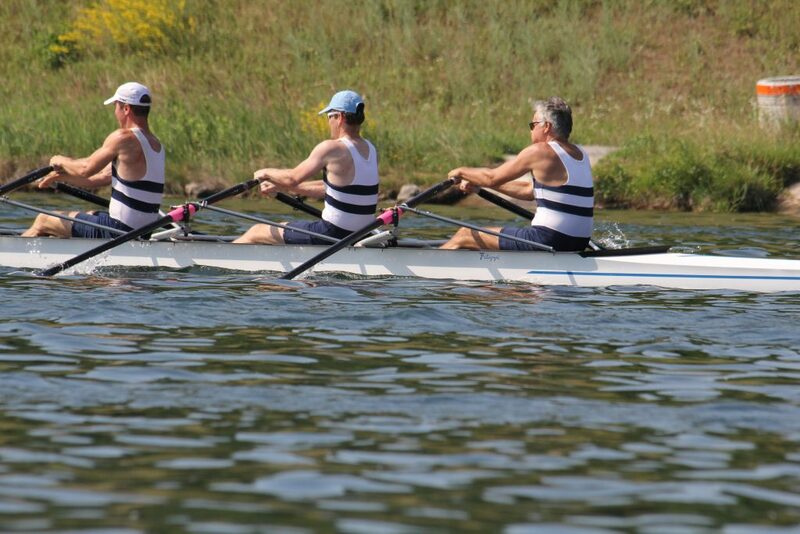 I had never rowed with this crew, but I think I blended in quite nicely, seated on 2. Despite being an E boat, the crew from Salzburg was a very serious competitor on the first 500m. That could also be said about the Bohemians crew. For the Bohemians, this classification could actually be extended to the second 500m. But by solid rowing we were able to push our boat out in front, centimeter by centimeter, pushing against the headwind which made it feel like we were rowing in concrete. Looking at the picture, with me seated on two, Andreas on bow, Marko on 3, and Alex, invisible on stroke seat, I think I blend in quite well. Phew. We managed to push our bow ball across the finish line a few seconds before Bohemians. This had been a long and painfully intensive 1000m. To our surprise, the winning time went to the E crew from Salzburg, because they got a bonus of 11 seconds according to the Austrian handicap system. Well, we still got a silver medal, and we did win the race on uncorrected time. Andreas and I could just move our sculls from the landing dock to the launching dock and get our double. 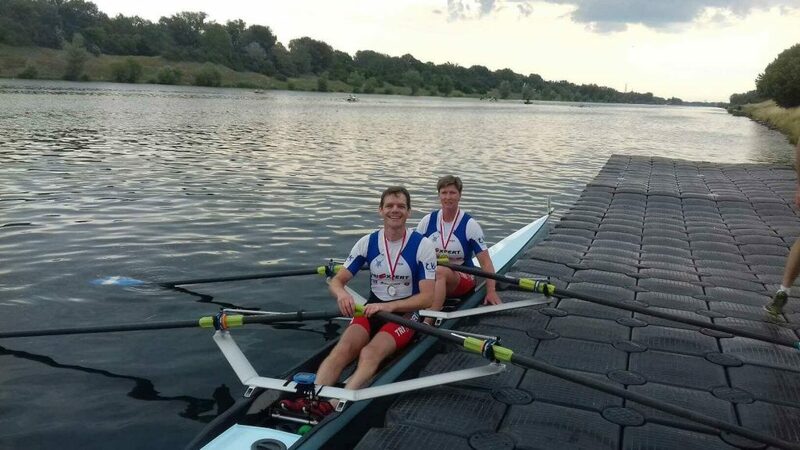 We rowed in a nice Filippi belonging to Andreas and Marko, and we pushed off with 9 minutes left to get to the start. Not a lot of time to get together as a double. To make things worse, I had forgotten to drink from my water bottle, which I had left on the dock when we pushed off with the quad. At the start line, with us in lane 1, I was surprised to see a pair lining up next to me. We were four double and a pair. The headwind had become even stronger and there now was serious chop. I didn’t know any of the competitors but Andreas told me that it “was doable”, so after the “GO” of the quick start I set off as furious as my body, still tired from the quad race, would allow me. We were all boats in one line but in the second 250m, Andreas and I managed to pull away by about a boat length. A bit before the 500m mark I asked for a power 20, and we did rate up and tried to pull away further. We were quite unsuccessful in that. I think that the difference with the pair even got smaller. A pair, in serious chop and headwind, able to pull us in? 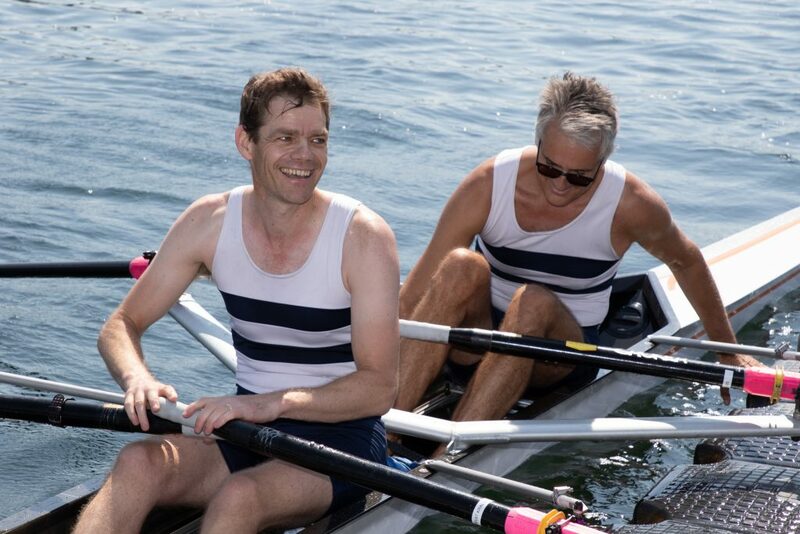 Well, it turns out that is possible when the rowers are Laszlo Kokas and Attila Strochmayer. The race turned out spectacularly for the fans on the shore, but it was extremely painful to our tired bodies. In the end, we managed to cross the finish line 0.43 seconds before the pair, but to me the true winners are the guys in the pair. Normally, a pair should be a few seconds slower when racing a double. Respect! Of course, we did happily collect our medals. I am quite happy with this result. We proved to be not slow, even with only 1100m of training together. 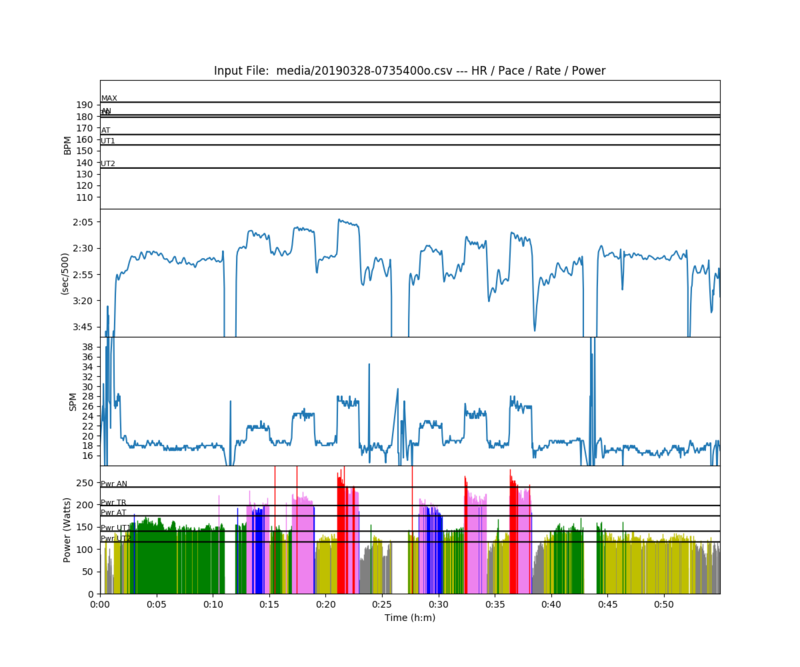 Again, just a crude pace plot from the Garmin Forerunner. Meanwhile, Romana had raced her double race with Veronika, where they unfortunately finished last, and she was now on the water in a quad. I had an hour and a bit to recover before my singles race, and the plan was to rehydrate and eat a healthy bar to get some nuts and sugar in my stomach. The rehydration plan went well. After two races without a sip of water, my mouth was really dry, but I did get my water bottle and drink. The eating a bit part was a disaster, though. Romana had hidden the car keys on a secret place, but I couldn’t find them. So I was walking around the race venue in my Donaubund uni with only a bit of water to drink. I watched Romana race her quad (third place) and then asked her where the keys were. Turns out they were on the exact place where I had looked, but I hadn’t looked well enough. I ate half of the bar and changed to my Brno uni, and then I launched with only 10 minutes to the official start time. I was lucky that the racing was a bit behind schedule. When I pushed off the dock, I realized that I didn’t have my SpeedCoach with me. This would be an unplugged row. 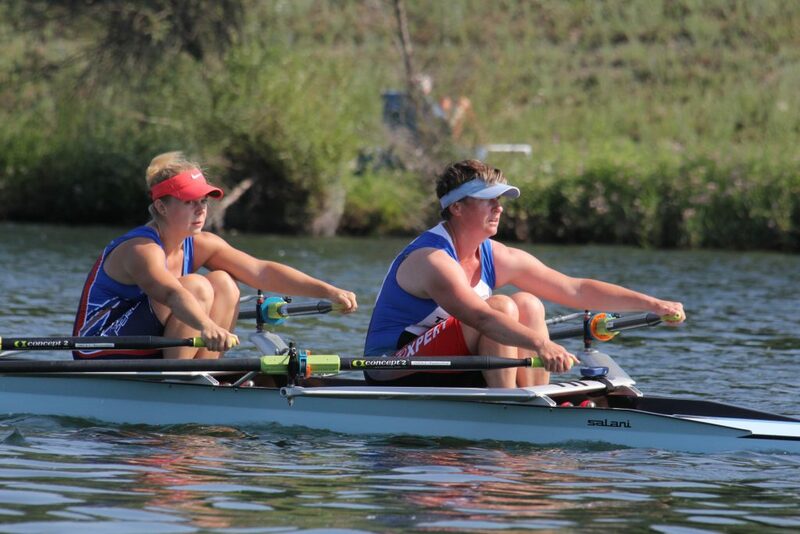 Six boats had registered for the MM1x C event, but only 5 were at the start. By now I did know the competitors a bit. 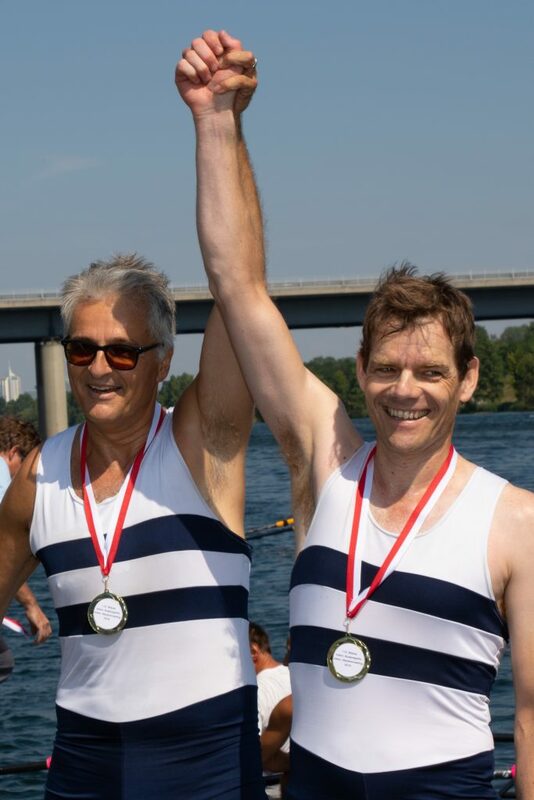 I was up against Jiri Rysavy from Bohemians Prague (who had beat me in the double and made my life miserable in the quad), Michael Helbig from Graz (beat me in the double on Saturday, DNF because of his partner in the Mix 2x), and two guys from two Vienna based rowing clubs. Because of the short time after two exhausting races and because of the excitement and less than ideal recovery between the double and the single race (entirely my own fault) I didn’t feel super strong for the singles race. I was actually expecting to finish last, probably with some distance between me and the other competitors. I decided to make the best of it and take this as a training row, focusing on boat run. It took ages for us to line up at the start in the headwind. The first attempt was good enough for me, but then the guy next to me started to realign his single because he had been blown into the buoys. The second attempt was successful and my race start wasn’t bad. 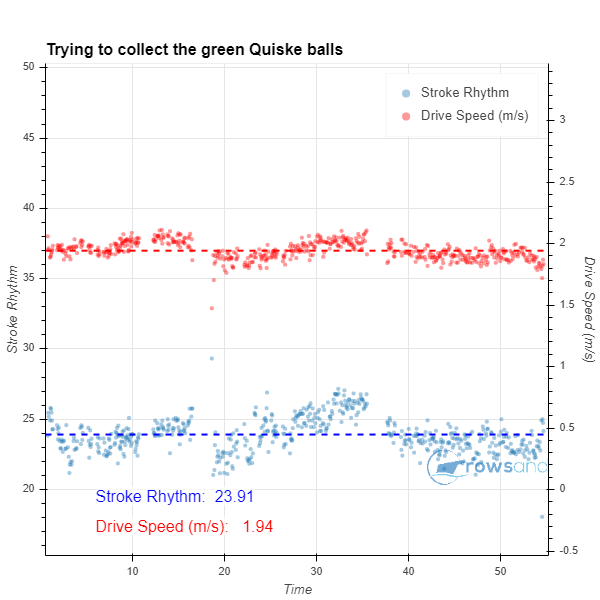 After less than 10 strokes, I settled down at a stroke rate that felt right. I don’t know the exact stroke rate, but I think I was just below 30spm, perhaps even dropping to 28. I certainly wasn’t pushing it hard. So, I was rowing in last place, but the surprise was that the others weren’t pulling away from me like crazy. There were two guys in front, about a boat length and a half ahead of me, then there were two boats that were about a length ahead of me, and then me, pushing along at a leisurely 28spm. The nice thing about rowing in such a tired state is that the dreaded lactate shock after 500m doesn’t happen. You just keep pushing along. By this time I was about a length and a half behind the others and I was focusing on boat run and trying to keep the Distance per Stroke (as estimated) as high as possible. Passing the 500m mark, I think I was rowing technically pretty well, because I was slowly pulling back into the field. Now, I was only half a length behind Jiri and Michael. I just kept going until I saw the pub in my peripheral vision to my left, which gives you about 150m to row, and then I thought, why not try and pass these two fellows. I rated up and we created a fierce fight for third place. What? Am I level with them? Beep – beep – beep. We were all within one second, but unfortunately that last beep was mine. After a long 4 minutes and 15 seconds. You know what? Even though I came last, this race in the single really made me happy. 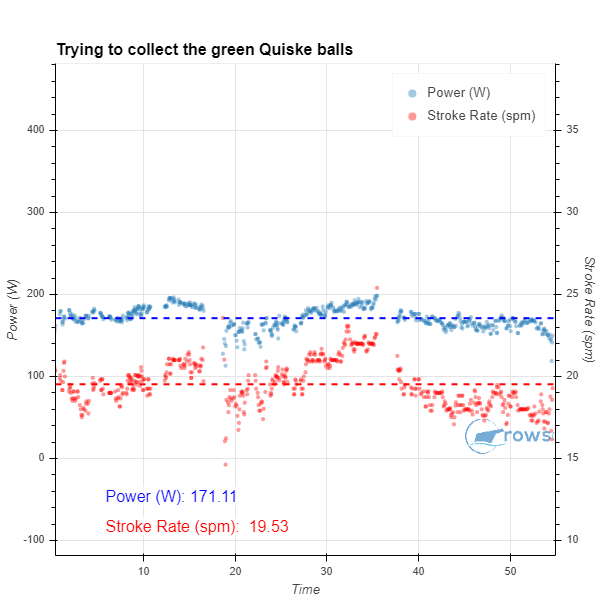 I think I showed some solid rowing there, and I found out that at 80% I am able to stay with the field. Now I will start with more training sessions dedicated to 1000m sprint racing, and I should be able to work up my base speed by end of July (Euromasters). 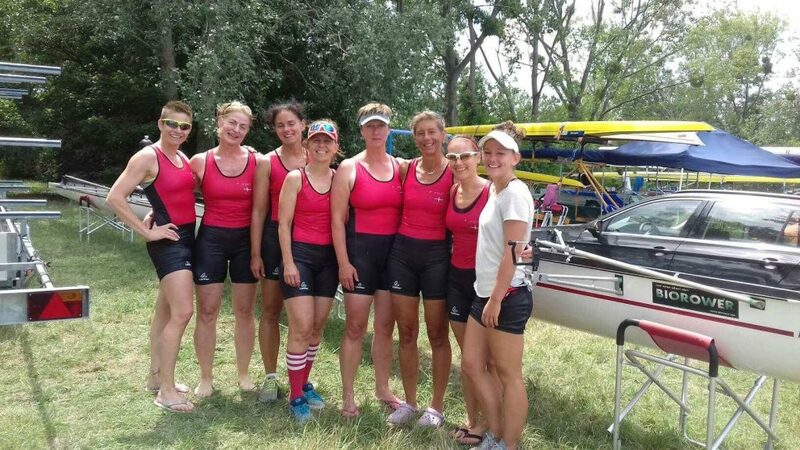 Then we had a hamburger and watched some racing, put our boats on the trailer, and waited for our Slovak friends from Piestany to race their Mixed 4x (which they won). The drive home was fast and without incidents (luckily) and after parking the trailer at the club we were home by 7pm. 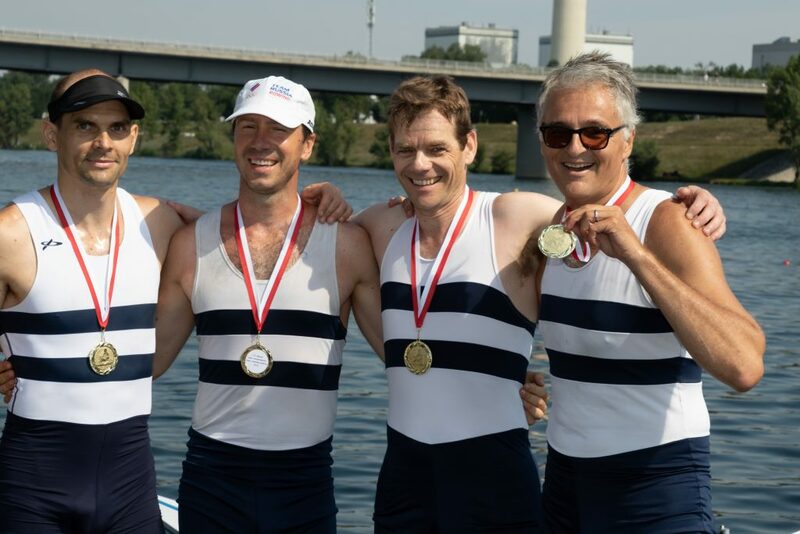 Our first attempt to infiltrate the Austrian Masters scene has been really successful and I should thank the race organizers and volunteers for a perfect regatta. The only thing that should be improved is the wind direction. 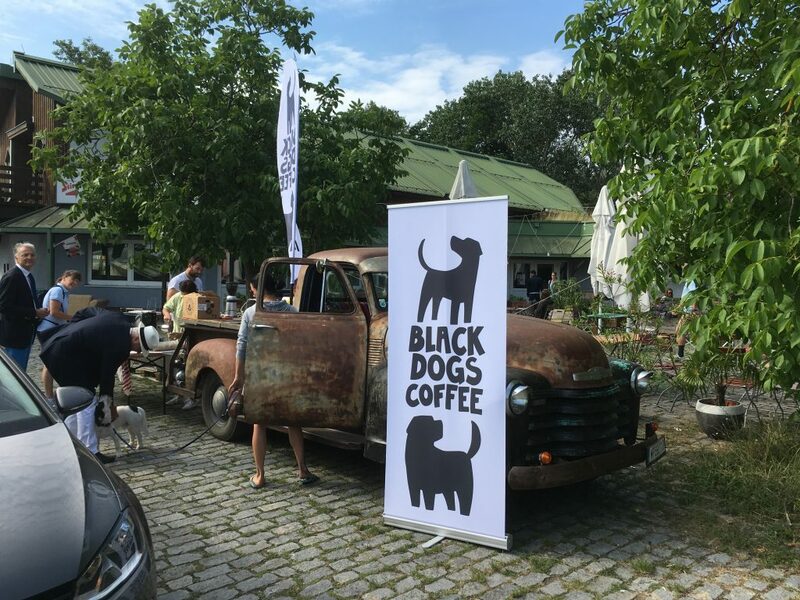 Also, big thanks for Natascha Kral (Andreas’ wife) for shooting the great pictures that I used in this blog. You may have noticed that half the pictures in this post (and in the previous one) look professional and the other half look slightly amateurish. The professional looking ones were done by Natascha. Click here to see more great pictures by her from this weekend. There was a pretty strong headwind. Rowing to the start, Vojtech and I did a few 10 stroke bursts, and we did some practice starts which were pretty good. On the real startline, we were just three boats. The Masters rowing scene in Austria is a bit smaller it seems. There was a Vienna/Graz combination, a boat from Bohemians Prague, and us. Our race start was a disaster. We caught a semi crab. Not a real hard crab, but the kind where the boat just starts to roll and you can’t row full pressure. We corrected for that in the second stroke, but we were already behind. 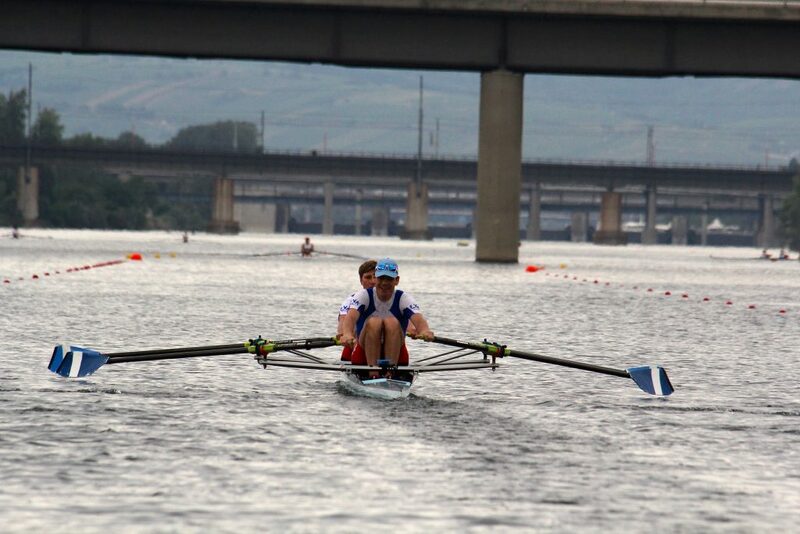 In the first 500m, we managed to row to second position, but we led the Prague guys get out too far in the front. I was expecting them to crumble in the second 500m but that didn’t happen. These chaps have been training hard in the winter. In the end, even the Austrian crew started to pass us and beat us on the finish line. Talking to the Prague guys confirmed that they have been putting in the hours through the winter, and also, they have done a bit more racing this season than us in Moravia. These were the first kilometers that Vojtech and I rowed together. We are definitely not fast (yet?). 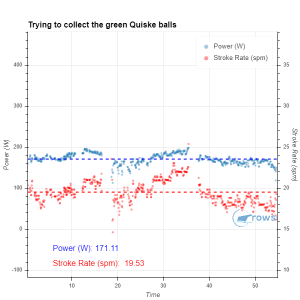 As Vojtech, later that day, proceeded to win the Masters D 1x with ease, it shows that the watts are there on his part, so it is either my lack of power or just bad rowing in the 2x. I hope it is the latter. There is a lot that can go wrong when racing in the double. 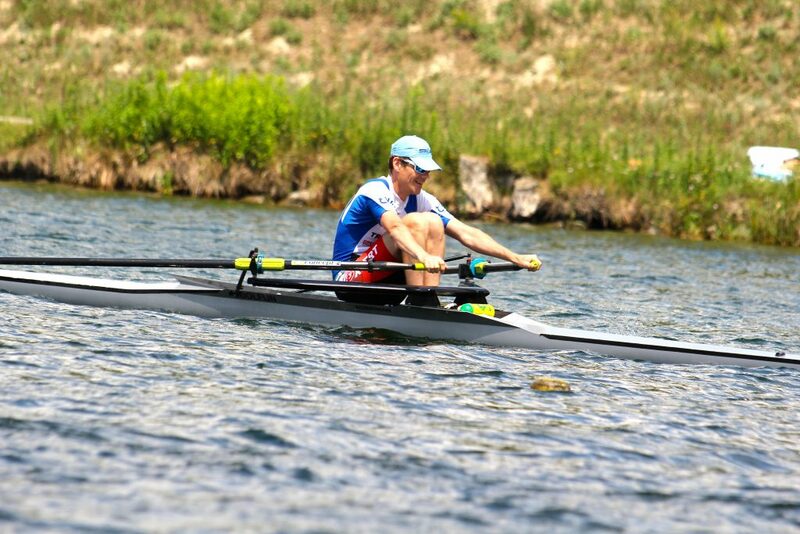 I do note that in the single, Vojtech has a very short stroke, and we both have to change our rowing quite a bit to row together. Respect for the chaps from Bohemians! Four boats at the start. 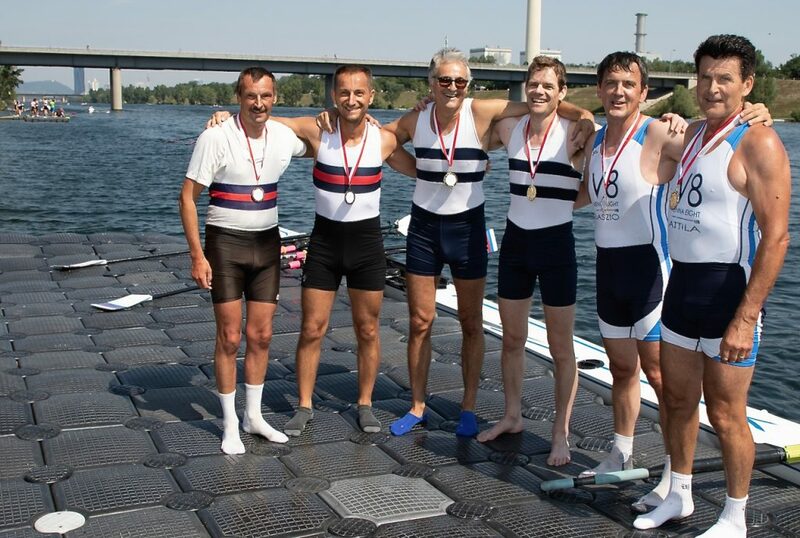 The Helbig family from Graz, a crew from Linz (Sames/Nigl-Eder) and a crew from the Vienna rowing club Donau (Bertagnoli/Bandera). And us. 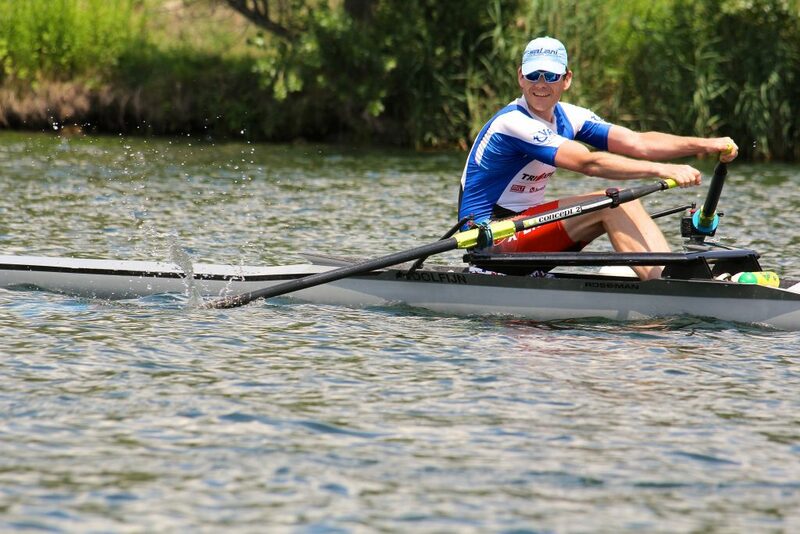 Michael Helbig had stroked the MM C 2x which had beat us on the finish line. The others were unknown to me. Still a pretty strong headwind. But we shouldn’t be a slow crew. Our race start was terrific. From peripheral vision I knew the other boats were right with us, but I didn’t want to look and just pushed out the first ten strokes, then settled to race pace. Romana later told me that we were leading, but I wasn’t aware of it. About 20 strokes in, I was dealing with waves coming in from the left (a launch wake that just caught us in the highest lane, not the others, I think). Romana later told me that that was were Graz was passing us. By the time I was checking on the situation, we were in second position, half a boat length behind Graz and leading by half a boat length on Vienna. I also heard the lady on the Graz bow make some weird noises and I called for a power 20. 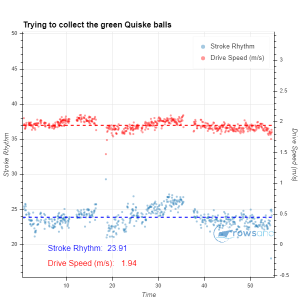 You can clearly see that moment in the stroke rate data in the chart above. We passed Graz and they stopped rowing. I mean, completely stopped rowing. DNF. Not sure what was going on there. I suspect that Michael went out too fast for the lady to hold it, and she had cramp or other problems. The Vienna crew was more than two boat lengths behind now, so there was no reason to be concerned. In front of the grandstand we did a 5 stroke “sprint” just to show off and that was that. We went and picked up our medal and then we did a pretty long cooling down row in the cooling down zone. While we rowed the last 2km back to the dock, the wind had calmed down and the water was flat, and we locked in a magical 20spm with a great rhythm. 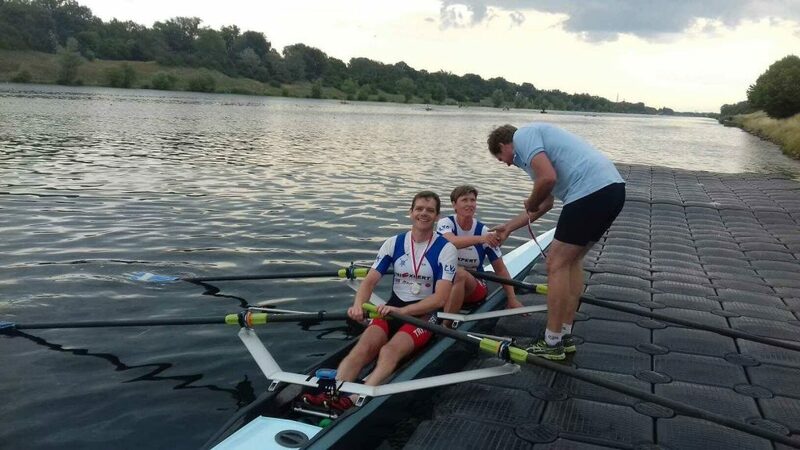 It’s nice rowing with a medal around your neck. It shows that rowing a double takes practice. Romana and I have done our kilometers together and that paid off. We went back to the hotel and had a great Italian dinner, where we were joined by Veronika, Romana’s double partner.